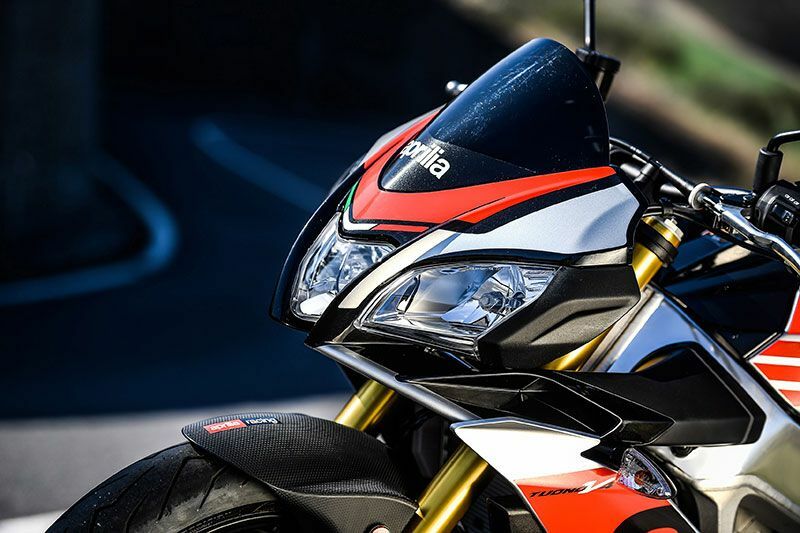 FASTEST AND SPORTIEST: The latest and most spectacular evolution of a sport naked dynasty, born in 2002 out of Aprilia's intuition to strip down and fit a handlebar on their flagship superbike (which at the time was the V-twin RSV mille), thereby combining all the advantages of a chassis par excellence with the fun of sitting up and dynamic riding. 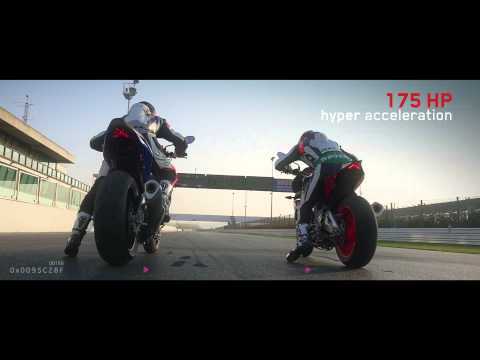 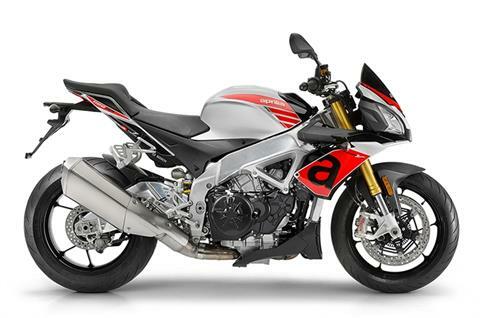 The patriarch of the new "supernaked" category was called the Tuono 1000 R, the first ultra high performance naked. Aprilia Tuono has therefore always been a high handlebar superbike, unbeatable on the track and loads of fun on the road. WORLD CHAMPION CHASSIS: Simply incomparable, now more than ever. There is no other naked bike as sporty and effective as the Tuono V4 1100; its close derivation from the six-time world SBK champion is clear when you look at the beautiful double rail frame made from pressed and cast brushed aluminum elements, a structure that boasts unrivalled balance between torsional stiffness and flexibility; the 65° V4 engine is set inside it in all of its purity and uniqueness, just like a precious stone set in a ring. 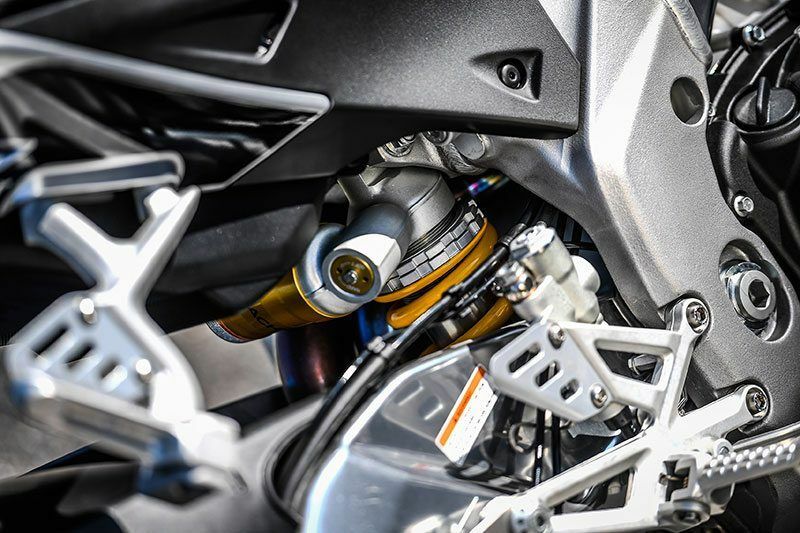 In order to make the Tuono V4 1100 more agile on the road, without losing its legendary fierceness on the track, the headstock angle was changed from 25.1° to 24.7° and the fork advancement went from 30 mm to 35 mm for a trail that went from 107.4 mm to 99.7 mm. These sleeker chassis dimensions combine with the 4 mm longer aluminum Swingarm, the various suspension setups and the consequent adjustment of the electronic controls, including the wheelie control feature, to obtain a rock solid chassis at high speeds but more agile in direction changes. 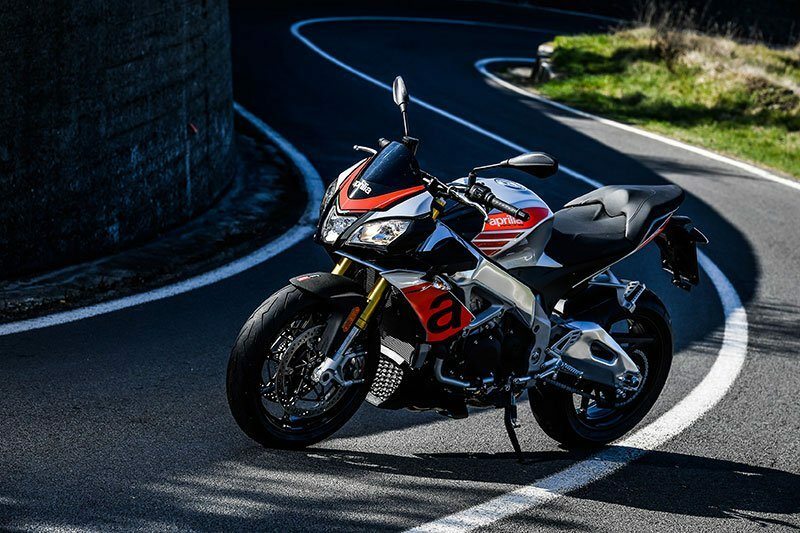 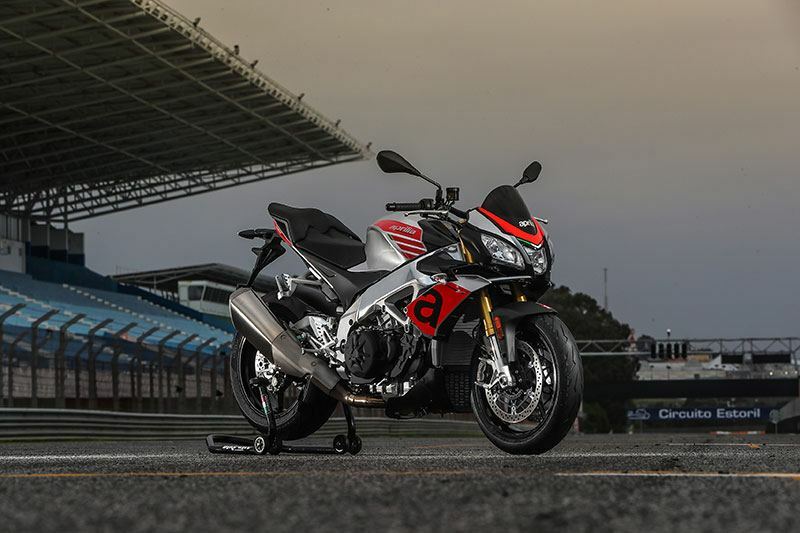 HIGHER PERFORMANCE: The primary goal of the changes made to the already extraordinary Aprilia Tuono V4 engine was to increase torque, especially at medium-low revs in order to increase effectiveness and riding pleasure on the road. 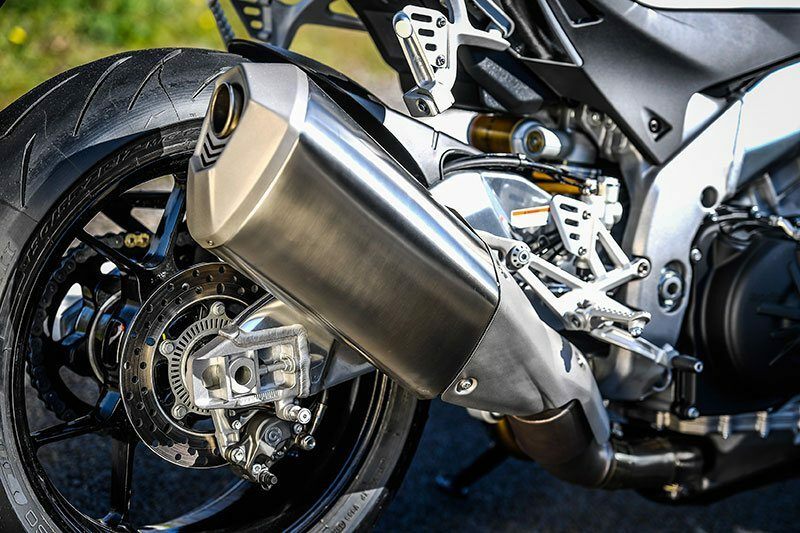 To achieve this goal the engine capacity was increased to a full 1077 cc thanks to the cylinder bore which was taken from 78 to 81 mm. 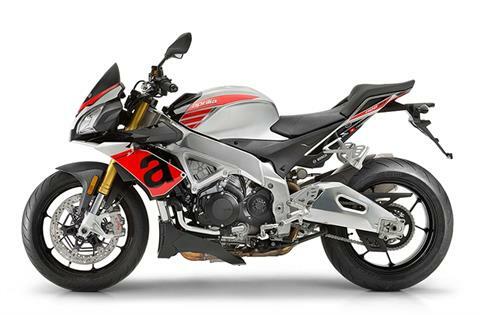 This increase in displacement also resulted in higher top performance: the power peak went from 170 to 175 hp and places the Tuono V4 1100 range at the top of its segment (already at 8,000 rpm almost 20 hp more than before are available). This makes the sport naked from Noale excel as a compete weapon for thrills and effectiveness with superlative torque values that dominate on the road and uncompromising top performance to dominate on the track. 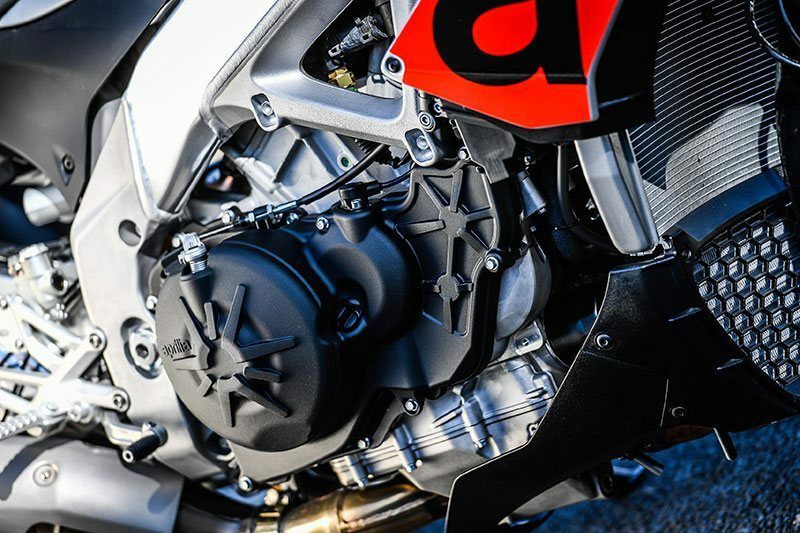 APRC: The Tuono V4 1100 range has received all the upgrades to the already exceptional APRC system that was first seen on the RSV4 RR and RSV4 RF. 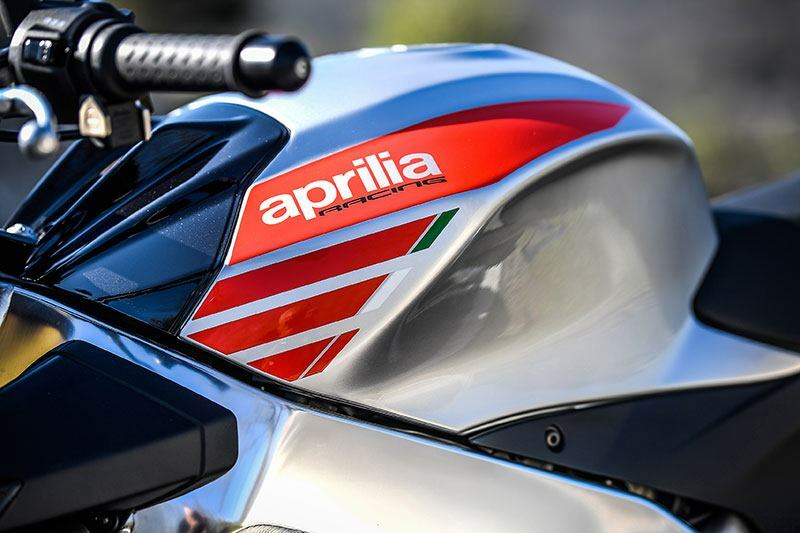 As everyone knows, APRC (Aprilia Performance Ride Control) is the patented control systems package derived directly from the winning technology in the world Superbike championship, the most compete and refined of any on the market, which provides tire circumference self-calibration features and wheelie control. 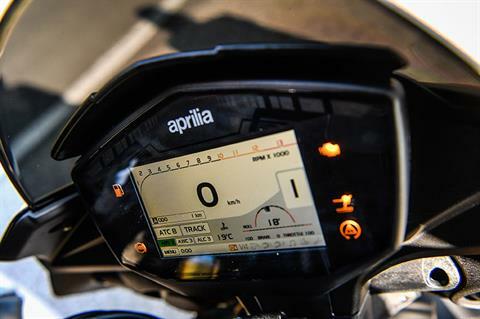 The third generation of APRC, standard equipment on the Tuono V4 1100 units, fully integrates with the fine full Ride-by-Wire multimap electronic management of the revamped V4 engine. 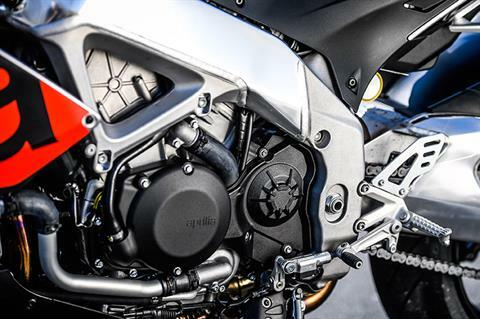 As always, the Tuono V4 benefits from a specifically developed calibration, but it has evolved even further in order to provide maximum thrills on the road and maximum performance on the track. Rear - 220mm disc. Brembo 32 mm 2 isolated piston caliper. Rear brake pump with integrated reservoir and steel braided lines. 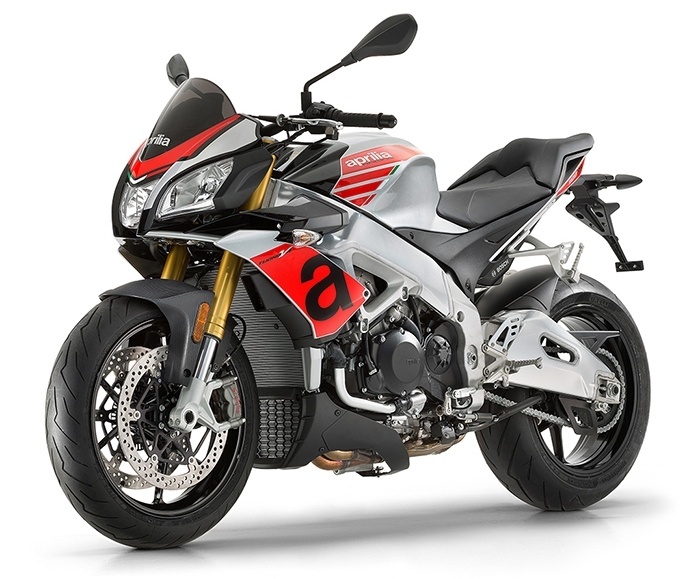 ABS - C-ABS Bosch 9.1MP, de-selectable, adjustable to 3 mappings, with RLM (Rear wheel Lift-up Mitigation strategy. 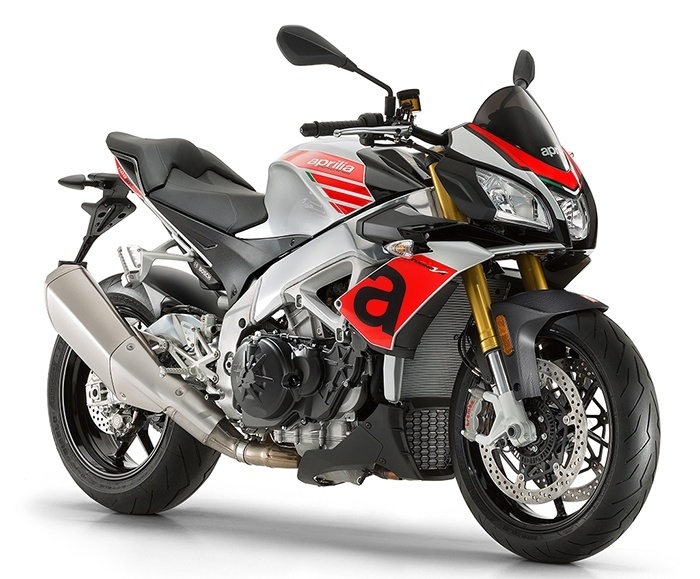 APRC (Aprilia Performance Ride Control) system including (ATC ) traction control, (AWC) wheelie control, (ALC) launch control, (AQS) quick shifter with auto-blipper, (ACC) cruise control, (APL) pit limiter, cornering ABS, all Independently settable and de-selectable. 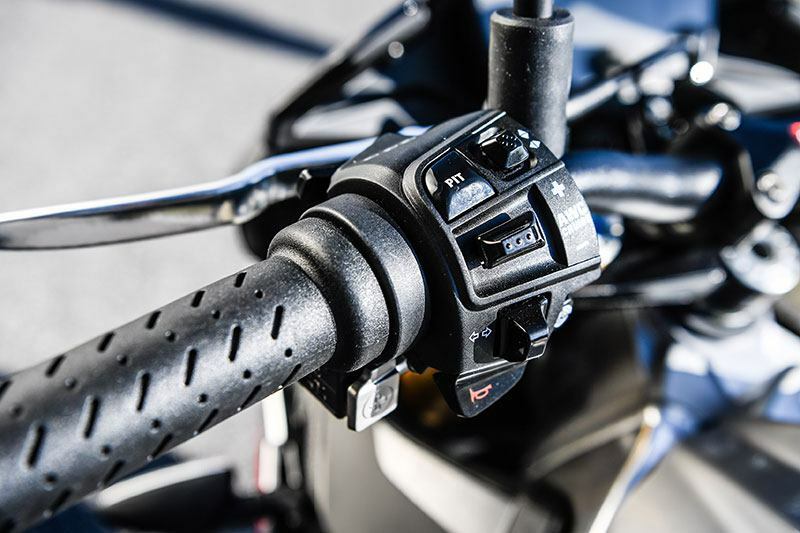 V4-MP 2.0 as standard.